Home Government Whose Boats Are Behind Brick’s Municipal Building? Whose Boats Are Behind Brick’s Municipal Building? For years, visitors to the Brick municipal complex have been noticing boats lined up behind the roadway that circles town hall and the police department. The rumor mill has produced numerous explanations, including that township employees were using the space as a free dry dock. The reality: the boats behind town hall were removed in the aftermath of Superstorm Sandy and, closing in on four years later, several still remain. “They were blocking roadways, or just dislodged and found somewhere they shouldn’t have been,” said Joanne Bergin, the township’s business administrator. 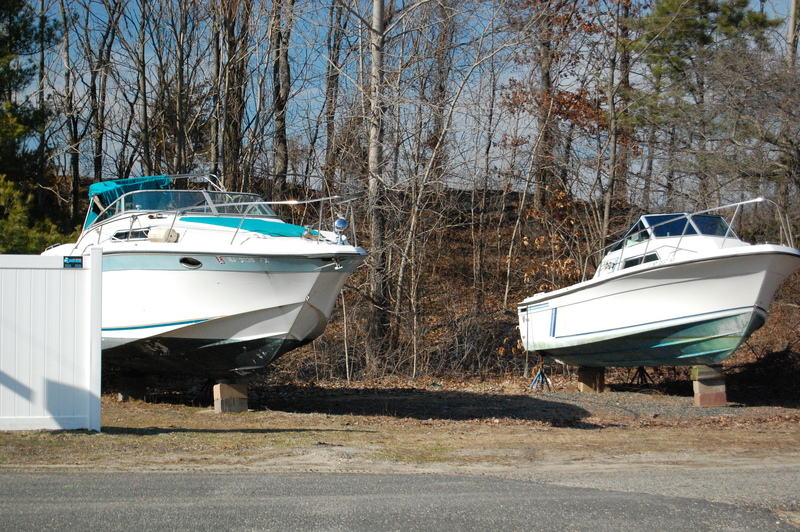 Derelict boats that washed onto roadways and other public spaces during the Oct. 2012 hurricane were first brought to the former Foodtown parking lot off Route 70, where they were held for months alongside piles of debris. Eventually, they were moved to the town hall lot. That’s where the hard work began, identifying the boats’ owners and trying to convince them to pick up their damaged vessels. The township, on its own, cannot simply dispose of the boats until a legal process is carried out to transfer ownership so they can head to a junkyard. The township’s safety coordinator, Joseph Gilson, has been tasked with doing the necessary detective work. “A lot of people are hard to track down because they have no interest in a beat-up boat,” said Bergin. The number of boats behind the municipal complex has slowly-but-steadily dwindled, but several remain. One of the boats was finally removed last week.